Our favorite lemon tart vape juice? Wow. Slightly tart lemon curd, topped with a smooth meringue and served in a flaky butter crust. There’s really not much to dislike about Dinner Lady Lemon Tart! I totally dig the branding on the Dinner Lady line of liquids. They managed to keep everything professional, staying away from any cartoon characters, or vulgar titling. The bottles are designed in a professional manner, the flavor profile is straightforward, and it just works. The yellow Lemon Tart bottle is a nice touch as well! 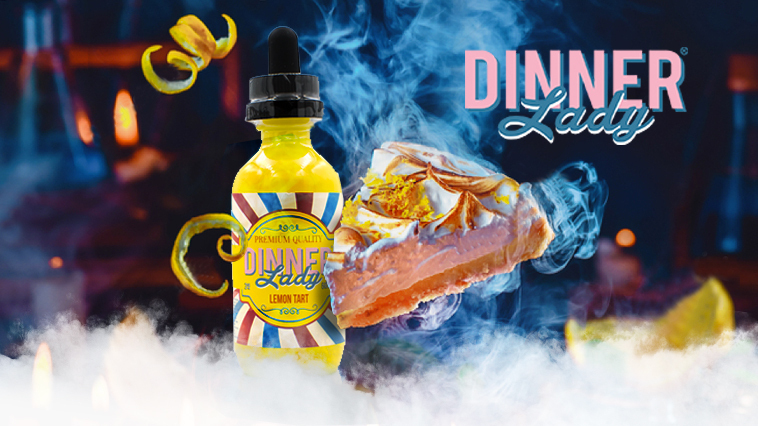 Sharp lemon curd topped with gooey meringue, all cradled by a thin pastry crust making this vape juice delicious & delectable. Exactly as the title would suggest. Some sweet notes of meringue and hints of lemon zest. The note is not overly complex, which should make for a very clean vape! Dual 2.5mm claptons on the deck of the Twisted Messes Squared RDA. Compared to larger 3mm ID coils, these claptons come to life in a matter of milliseconds. And the coils cool down almost immediately after they’re fired. No sacrifice in flavor production, and cloud production is right on point! Front – Perfectly balanced lemon flavors. There’s a bit of juice and hints of a more potent zest. The tartness that one would normally associate with lemon is not an issue. The liquid has just enough sugar to eliminate the tart, and not a touch more. No signs of the crust here, but I was able to pick up on some liquid butter. Middle – The meringue really comes through in the middle of this vape, and works with the lemon to create a really nice filling. This crust is not quite as prominent as I expected it to be, but is super flaky and buttery. There’s a nice chewy mouthfeel here as well, that makes for quite a nice vape. End – The lemon curd meringue combo is absolutely perfect. Because most of the tartness has been eliminated from the lemon itself, it allows for the flavor to really be appreciated. At this point, the crust serves as more of a carrier than anything else, and even though it’s not quite as strong as I would’ve liked, it works very well. Aftertaste – Super clean. The sugar content in this flavor is just enough to keep the tart characteristics of the lemon at bay, and doesn’t really become an issue with lingering flavor. I vaped this one for hours at a time, and never felt the need to take a sip of water. The 2.5mm claptons pushed this 70/30 blend to the max. The clouds weren’t as dense as a max VG, but I was still able to fill a large room with clouds in a matter of minutes. Absolutely great flavor from Dinner Lady; In fact it may just be one of my favorite lemon tart flavors ever! Would I recommend it to a friend? Absolutely! Would I purchase another bottle? Already have! Going on my third 60ml actually!